In this scenario we will be implementing a openWRT as a wireless access point only. One wireless essid will be LAN accessible and the other will be segregated from the LAN but able to access the WAN. 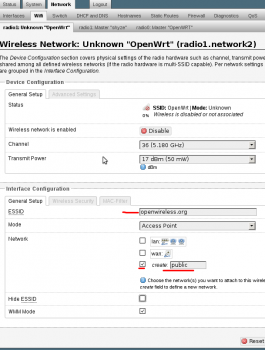 The openWRT in this example will not be the gateway to the network. Another device is the gateway and there is an existing dhcp server. 2. Settings for the new wireless access point. 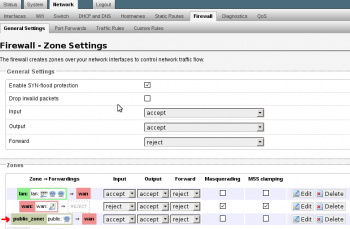 Create a new network interface of “public”. Don’t use any encryption, as this is for general public use. 4. 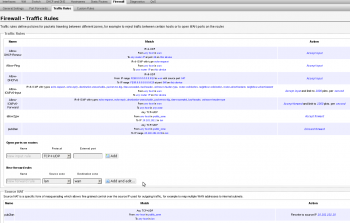 Edit PUBLIC interface settings. 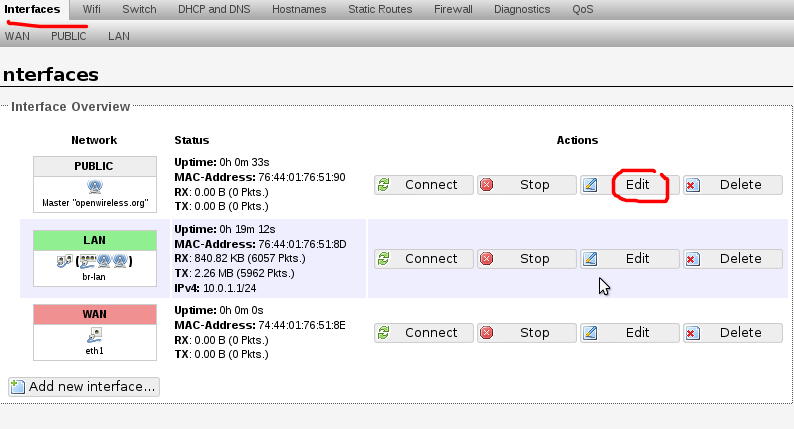 Set to static address and enable DHCP server for this new network. 5. Edit the LAN interface. 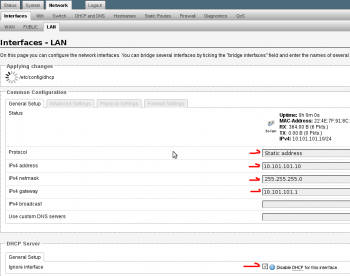 Set the lan interface to an un-used ip of the existing network. 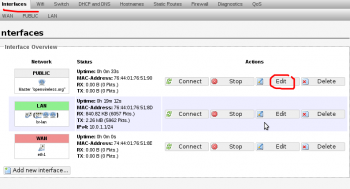 Don’t set to “dhcp client” as you will lose connectivity and need to perform a recovery on your openwrt device. 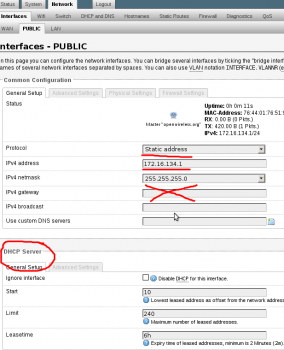 Be sure to disabled the DHCP server as the existing network already has one. 6. Add a new zone and call it “public_zone”. Masquarade it and put it in the public network. Allow forwarding to and from “lan” zone. We will limit this later with specific firewall rules. 9. 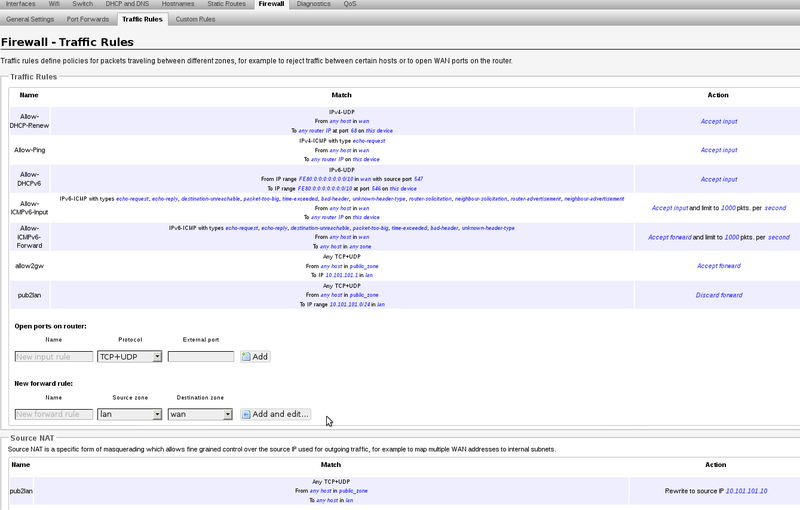 Setup a “New forward rule:” Set name to allow2gw or similar. 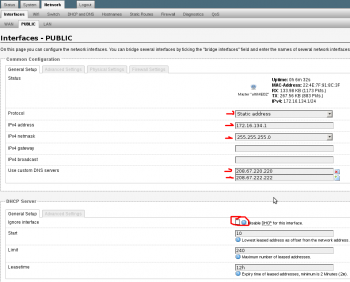 Source zone to “public_zone” Destination zone to “lan” Click “Add and edit…” Protocols should be “Any”, Destination address is the gateway of the network. In this case 10.101.101.1. The following is the /etc/config/firewall rule for reference. This will allow traffic from the public_zone to reach the gateway of the network. 10. Setup a “New forward rule”. Set the name to drop2lan or similar. Set the Source zone to “public_zone” and Destination zone to “lan”. 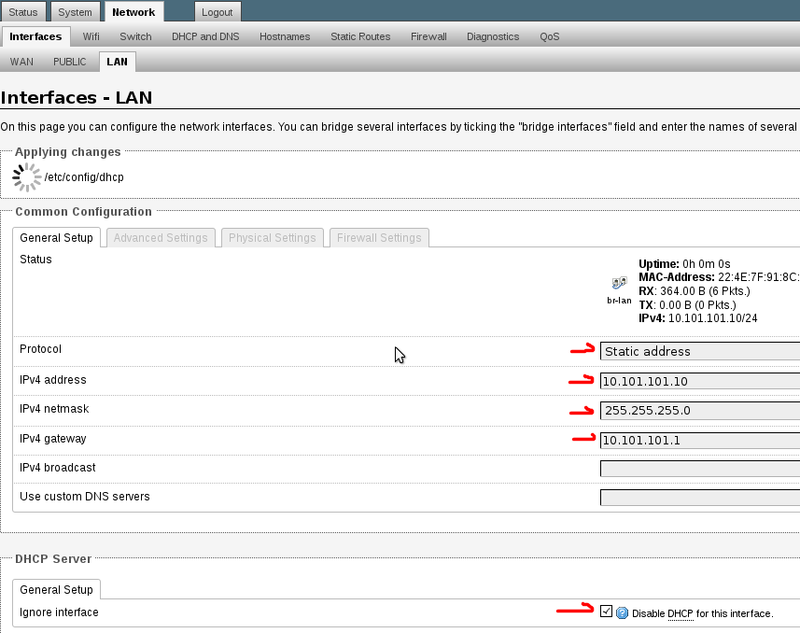 Click “Add and edit…” Set Protocol to “Any”, Destination address to custom and enter the subnet of the LAN. In this case its 10.101.101.0/24, set “Action” to “drop”. You can add more rules like this one to limit access to other networks or hosts as needed. 11. 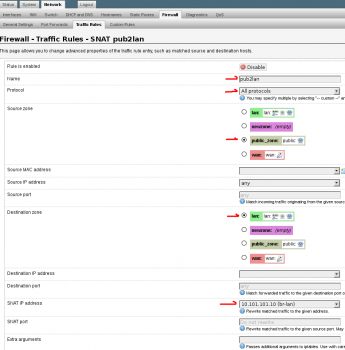 Firewall Traffic Rule overview. There is an error on this view. 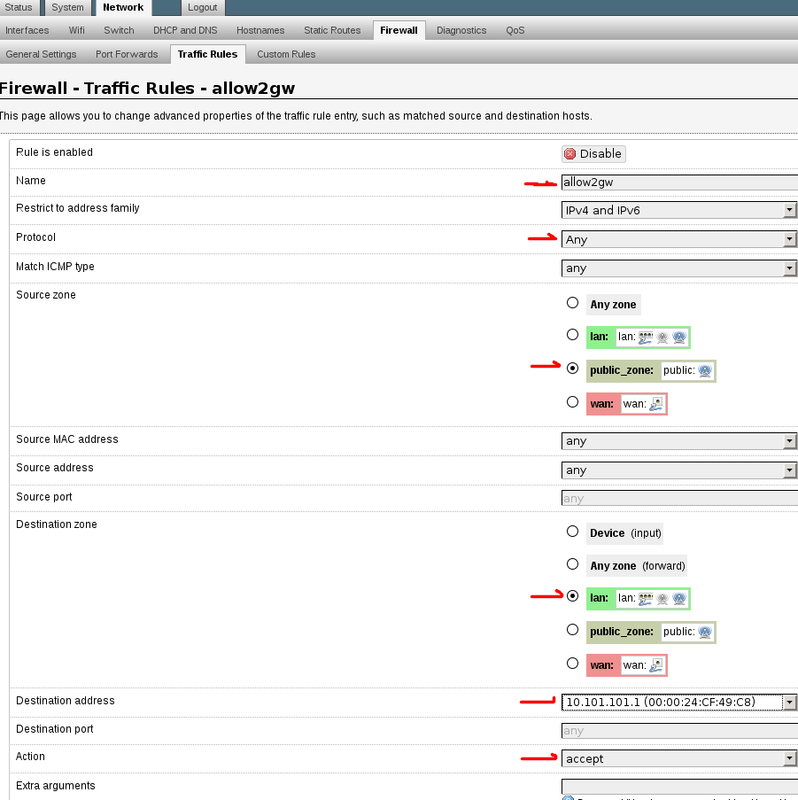 The following rules have “option proto ‘all'” set and the luci web interface shows “Any TCP+UDP”. This is simply a bug in the luci interface and can be ignored. The order of these rules is very important. In this case you can see we added the “Allow to 10.101.101.1” before the “Drop to 10.101.101.0/24”. If reversed, the lan including the gateway would not be accessible from the public wireless AP. Therefore, you would not be able to reach the Internet. 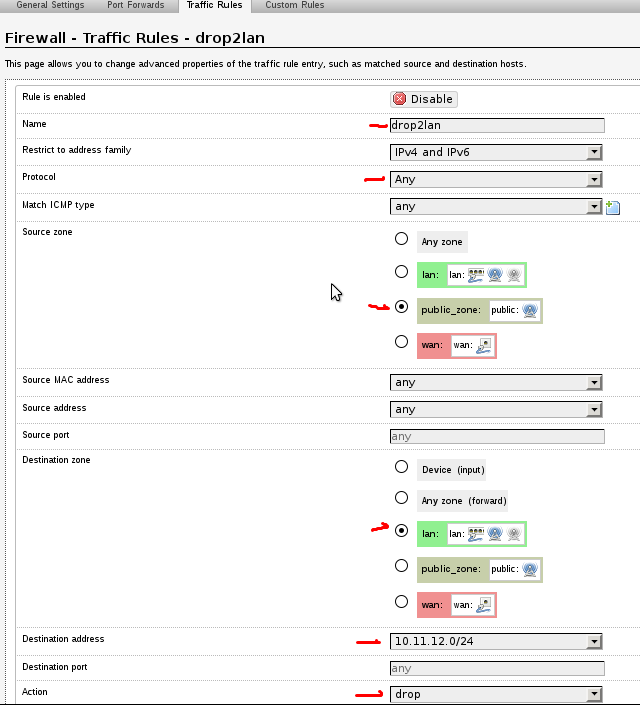 In this post I will outline how to use zones to create public firewalled networks. A device that can bring up multiple interfaces per radio is very attractive here. 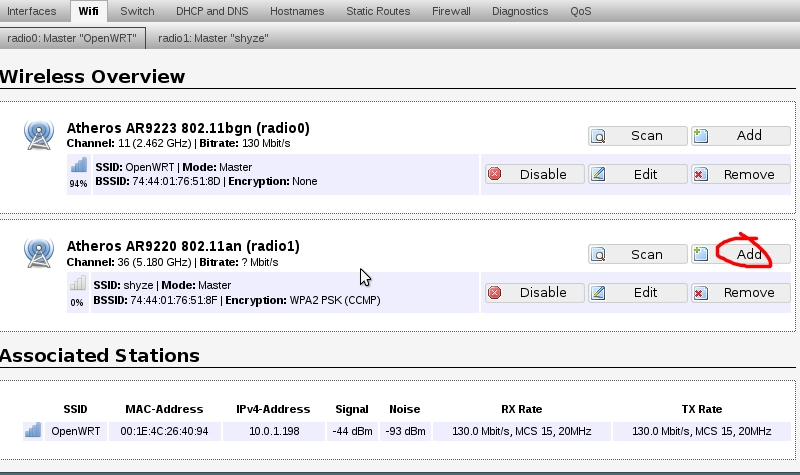 One essid for private wireless and another for open public wireless. The Atheros ath9k chipsets are very well supported in this regard because they are free software. Obviously the zone can be utilized however you like. 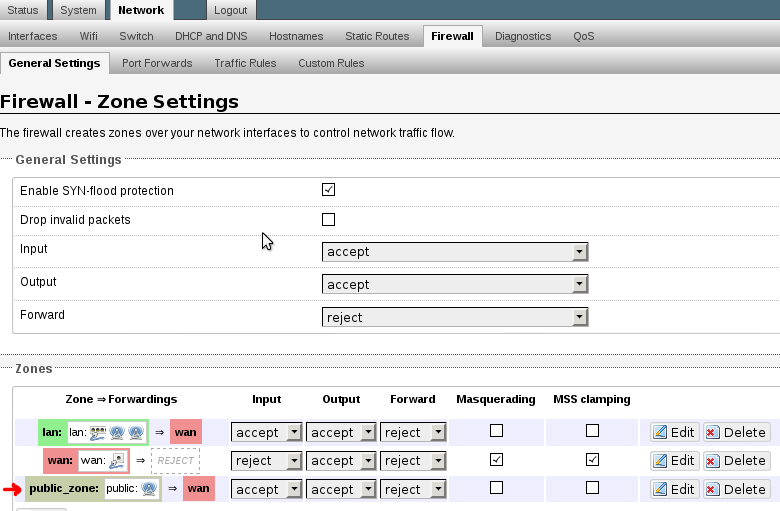 Another common option would be to firewall a open wireless network from the LAN. And forgo the insecure nature of a “secured” wireless altogether. The OpenWRT could be running openvpn, that you connect to over the “insecure” wireless, now thats secure! The following steps are done via the web interface (luci). 1. Start by adding a new wireless interface. In this case to the 5ghz radio. You can do this again for the 2.4ghz radio. 2. Set the essid and network name “public”. This will allow us to use firewall zones to segregate the networks, rather than excluding individual rfc1918 subnets like in the first example. 3. Edit the interface “PUBLIC” so that we can set it as a static ip. 4. 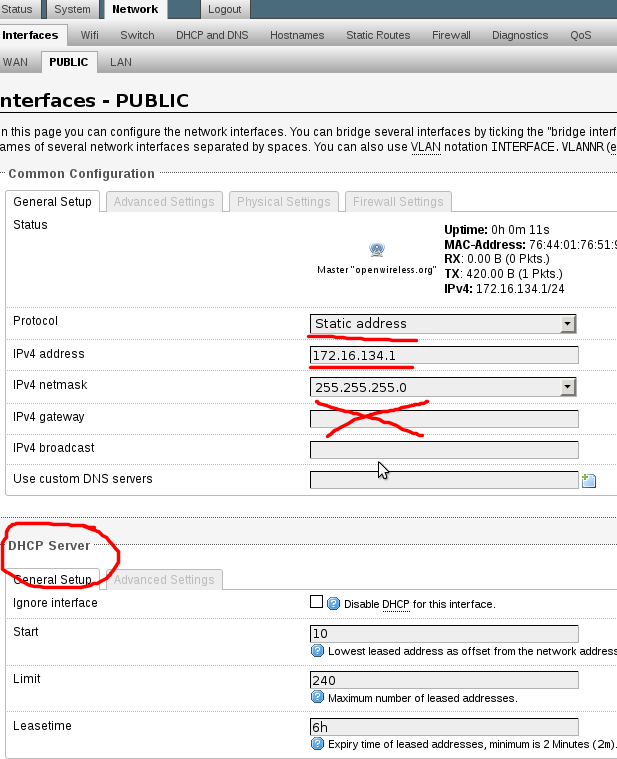 Change the protocol to “static address” set a ip for it and a subnet. DO NOT set a gateway. This will write a new default gateway to the routing table and cause the internet to break occasionally. Setup a dhcp server for this network. 5. In the firewall section. 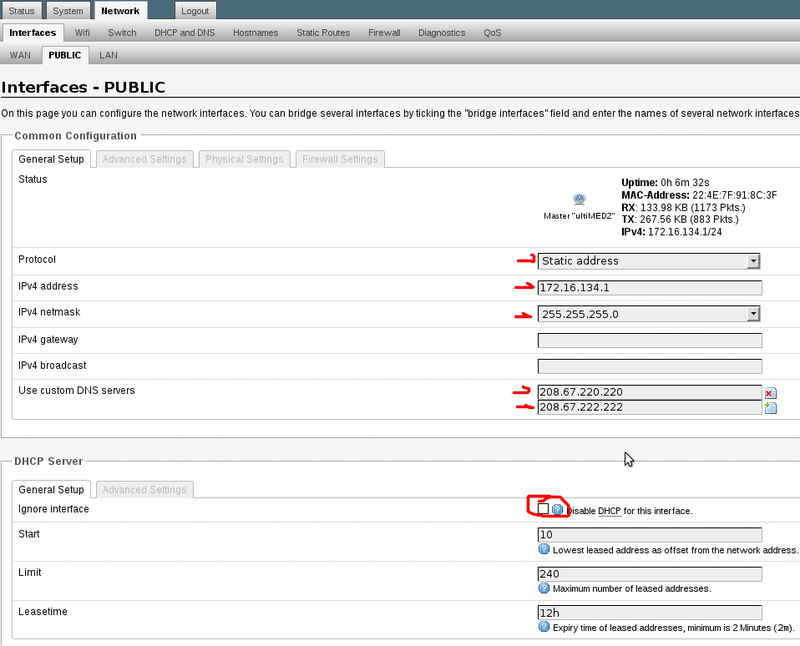 Setup a zone called something like “public_zone” and assign it to the “public” network. And allow it to forward to “WAN” zone. 6. This is what the general firewall zone’s should look like now. Be sure to test it. Connect to the public and try and nmap a known host on the private and vice versa. A few times I have needed to reboot the router for everything to start working properly. It could be because I tinkered too much and caused a hickup. Just something to keep in mind.. The updated and more flexible way to do this is outlined here. It also requires updated hardware. The wrt54gl only supports openwrt v10 (backfire). I would like to add that despite the wrt54gl literally being ancient, its still a rock solid device today. Of course, only if openwrt is installed! ISP <-fw-> office LAN 10.1.10.0/24 <-fw-> (linksys) "open public wifi"
#Insert this into the chain, so 10.1.10.0/24 (office) can connect to public 192.168.10.0/24. #This rule gets repeated by the setup script /etc/init.d/firewall. If you would like to have remote administration on the openwrt so you can access the luci web interface and ssh from the wan side of the router, you can change /etc/config/firewall wan zone to allow it. !!WARNING!! If you are directly connected to the internet, this will expose your open ports to the world. You should take precautions to secure them before changing this firewall rule.